A majority of the data sets from the web services of geodata4edu.ch can now also be integrated into the open source program QGIS. The web services allow the geodata to be worked with directly (exploring, displaying, extracting…). With the extension, these can now not only be accessed with the ERSI products (ArcGIS Desktop, ArcGIS Pro), but also via the well-known open source application QGIS. By clicking on the direct link (detail view of data) – after agreeing to the data usage agreement and creating a Basic Auth connection to the HSR web services – the selected data is displayed in the desktop GIS. With the exception of data sets published via ImageServices (e.g. swissimage), all data is available in QGIS. In order to access the data on the HSR portal for geodata4edu with QGIS, a Basic Auth connection to the HSR web services must be established. 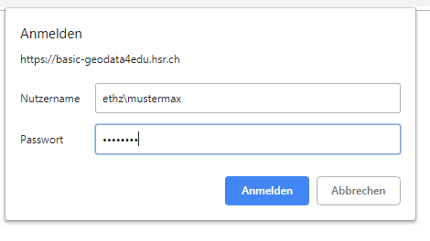 To do this, the desired service must be selected in the search https://www.geodata4edu.ch and the link “QGIS access” activated. A login window will be opened where the username/password of the users university account has to be entered. The user name must be entered with the domain name of the institution, e.g. for the HSR “hsr\mustermax”, for the ETHZ “ethz\mustermax” or for the ZHAW “zhaw\mustermax”. The following institutions are currently available: eawag, empa, epfl, ethz, hsr, psi, unibe, uzh, wsl, zhaw. In the following browser window the URL can be copied in the address bar. 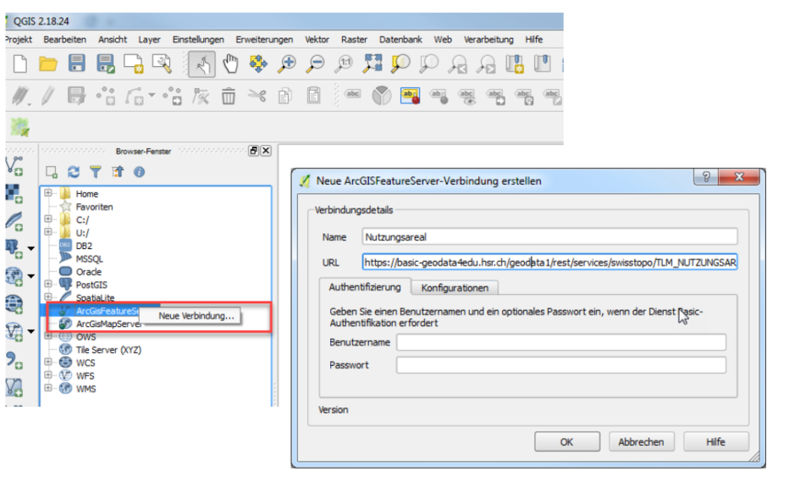 Note: In order to access the service view, the “QGIS access” button in the catalogue must be activated again (if this access is used for the first time). In QGIS, paste the copied URL via the “ArcGISFeatureServer” connection under “New Connection”. Double-click on the layer to establish the connection and enter the username/password again. Detailed information about the web services and the download service of geodata4edu.ch can be found in the manual.